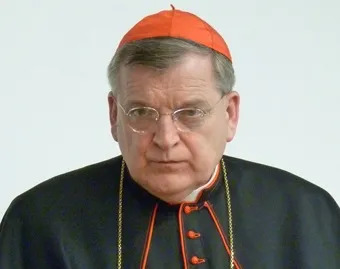 Vox Cantoris: Cardinal Burke; Amoris is not "magisterial teaching." Cupich calls it a "game-changer"
Cardinal Burke; Amoris is not "magisterial teaching." Cupich calls it a "game-changer"
Cardinal Burke has penned an assessment of the apostolic exhortation published in the National Catholic Register. He states what most of us already know, it is "not magisterial teaching" and certainly not "infallible" though you wouldn't know it from the papolaters out there. The problem is, the secular media and certain priests such as Edward Beck and James Martin make it seem that it is. This is why it is so dangerous to the faith. The Pope must speak and write (or have his minions write) with clarity and precision. Anything less creates a danger to the Faith and to souls. Then there are the clericalist types such as Dwight Longenecker who think that the laity are just "armchair" critics and should just shut-up. It is important to read all of what Cardinal Burke wrote and to read it slowly and carefully. He is not condemning the exhortation, but he is certainly not praising it either. His approach is clearly one of a Canonist. It is reasoned and rational. He makes it clear, it is the "opinion" of Francis, it is not infallible, it is not magisterial. Reading between the lines, one can surmise he is disgusted. Francis "thinks" Jesus is saying something different today than for the last 2000 years. This is ridiculous, but it his opinion and in my opinion, Francis is wrong. One of the liars and deceivers is Blase Cupich. Severe words to be sure to describe an Archbishop but Cupich is promoting that the exhortation is a "game-changer." So, who's telling the truth, Cupich or Burke? Are we, as simple laymen, expected to suffer confusion from the likes of Cupich or do we use our own God-given intellect to sort through the mess which Francis has created. The scandal arising from the AE is this; remember what they already told you they would do. SO if it is a personal opinion - why bother publishing? Popes are not to going about publishing personal opinions, but preaching and teaching the Gospel of Jesus Christ! It is part of the Papal Oath of Office. Te Pope is bound by the Gospels and Tradition. A 200 page document without the most important question answered. This is dereliction of duty. "Pope Francis makes clear, from the beginning, that the post-synodal apostolic exhortation is not an act of the magisterium. The very form of the document confirms the same." Therefore, Pope Francis is 100 percent innocent of the game that many people played during the past few days that portrayed the Exhortation as an act of the Magisterium. The people who trafficked in that game misrepresented dramatically Pope Francis' Exhortation. Once again, we have a case where Pope Francis said "X", but had his words twisted into "Y". Again, Cardinal Burke declared that Pope Francis had made it crystal "clear" "from the beginning" that the "post-synodal apostolic exhortation is not an act of the magisterium". Why did people misrepresent Pope Francis? O please pastors, keep yourselves locked away from the world. Please stay in your rectories, pray and be holy. We souls don't need pastors who do the tango. Our Modernist Hierarchy to a man has sat back & allowed PF to play scrabble with the Ten Commandments, the Magisterium & Tradition of the CC as he sees fit without any interjection whatsoever. He had a wonderful time at both Synods on the Family, ending with this Apostolic Exhortation Amoris Laetitia, & one wonders what treats he has arranged for the next Synod on Ordination. It has been estimated that 50% of our priesthood is homosexual so the rainbow colours will certainly adorn the Vatican when that one commences. Cardinal Burke made the following vital point: He denounced claims that have portrayed the Exhortation as "a revolution in the Church" and "radical departure from the teaching and practice of the Church" in regard to "marriage and the family". Cardinal Burke insisted that those who have portrayed the Exhortation as a departure from Church teaching have sown "confusion" and committed a "disservice" to the Church. Cardinal Burke even noted that it is "potentially a source of scandal not only for the faithful but for others of good will who look to Christ and his Church" to claim that the Exhortation is "revolutionary" and a "radical departure" from Church teaching. My heart sunk when the first reports from various Traditionalists portrayed the Exhortation as revolutionary and unorthodox. The news media portrayal of the Exhortation as revolutionary didn't bother me as much as the news media are clueless when it comes to Catholicism. But that which my many Traditional Catholic brothers and sisters in Jesus Christ had said about the Exhortation upset me greatly. On the other hand, holy men such as Father Allan J. McDonald assured us that the Exhortation was wonderful, orthodox, and of great help to the Church. Nevertheless, I remained confused, to say the least, as to what to believe about the Exhortation. However, thanks to Cardinal Burke's very positive assessment of the Apostolic Exhortation, I am at peace in regard to the Exhortation. Cardinal Burke has rejected the notion that the Exhortation is "revolutionary" and a "radical departure" from Church teaching. Cardinal Burke has been called by God to guide God's Holy People to the Truth. Therefore, my brothers and sisters in Jesus Christ, let us rally around Cardinal Burke's reassuring words in regard to Pope Francis' Apostolic Exhortation. Let us begin to mine the Exhortation for beautiful teachings and practices that will make families holy and strong in God's Truth. Let us mine the Exhortation for the holy gold that Pope Francis and the Synod Fathers have offered to the Faithful and world. Let us extract from the Exhortation all that will uplift Catholic (and non-Catholic) families. In that regard, let us follow Cardinal Burke's lead. He is a holy man. Let us heed his words on the Apostolic Exhortation. If Pope Francis' Exhortation is not Magisterial, what is it? If it the private opinion of a doctor, why does he confuse the Church. In fact, it is not the private opinion of a doctor, for he expressly addresses the whole CHurch. Therefore, it is a "pastoral" opinion that impacts doctrine. I ask again: why has Francis refused to answer the question: are divorced and "remarried" Catholics allowed to receive Holy Communion? There is one great joy in all of this: Francis could not, and would not dare to try to invoke Papal infallibility. In fact, we can say that the Holy Spirit has worked: He has blocked Francis. Yep, "not an act of the magisterium". And VII was only a "pastoral council", so was able to slip through without doing any damage.... right? Do people really need to be reminded how these revolutionaries work? And Anonymous 5.01pm, I most wholeheartedly agree. Cardinal Burke must clearly and unabashedly condemn the situational ethics contained in the exhortation. He must call it heresy. Pundits, Catholic and otherwise, of all stripes are calling the document revolutionary. Souls will be confirmed in their sins. Error will be promulgated. Cardinal Burke must be a true shepherd and risk his comfort for Our Lord. I'm sorry, but this is the very SAME thing, I do believe that happened during and after Vat.ll. In effect, it's moving the ball forward in a significant way to even more vile than we have seen since the 60's and 70's! Of course, this document was never intended to be 'magisterial', was never deemed 'from the Chair', so Francis gets a pass there. No way they can declare him a 'heretic'. NO WAY! He is smart, he knows how to skirt the doctrine and impose error without getting himself into a heap of trouble. I'm sorry, this 'Exhortation' is DIABOLICAL! We keep hearing the words doctrine has not changed ,only pastoral practice,is that not another way of saying "we will not practice what we preach",that doctrine is to be contained in the dusty vaults of the Vatican ,preserved but not practiced,just another museum piece.if that's the case ,what they're offering people is an empty faith ,fool's gold instead of the pure gold of Christ's Doctrine.If those who partake of the Body and Blood of Christ unworthily bring condemnation on themselves,what of those who encourage them to do so ? Is there anything in Canon Law (1917 or 1983) that says that the Pope can be sued for dereliction of duty and have the Apostolic Signatura (with Cardinals and Bishops on it) can render a decision? Just wondering. If I remember correctly, when the NO was approved by Pope Paul VI, the legislation looked like it abrogated the TLM but never did. For 40 years - except in TC books and newspapers - the lie that the TLM was abolished/abrogated was spread throughout mainstream Catholic and secular media. Then in 2007, Pope Benedict XVI issued SP, which stated what TCs knew all along - that the TLM was never abrogated/abolished and never could be. Plus it allowed the traditional breviary, Sacraments etc. I honestly think that in issuing SP that the liberals were so incensed that they wanted to get rid of him. Pope Benedict XVI will be 89 on April 16th. May God have mercy on him and Our Lady protect him. Is "Amoris Laetitia" an Apostolic Exhortation? Is it promulgated by authority of Bergoglio, in his capacity as Pope? Does his teaching treat of Faith and Morals? Is his teaching directed to the Universal Church? Is this exhortation published in his Acta Sedis? If the above questions be answered in the affirmative, then the conditions for infallibility are met and this document is of the infallible ordinary magisterium. Full stop! "Look, I have written an encyclical and an apostolic exhortation, and I continually make declarations and give homilies, and this is magisterium" There you have it from the horse's mouth. Burke has revealed himself to be a Novus Ordo apparatchik. If the pig that is Amoris Laetitia needs lipstick, Burke is it. His comments ultimately serve to further the modernist agenda by making excuses for and covering up the multitude of heresies and half-truths that Francis spreads in his Apostolic Exhortation. I couldn't help but think when reading his tripe that he must really take us for idiotic fools who'll drink whatever Kool-Aid is put before us as long as it's wrapped in a cappa magna. He has clearly expressed that he knows better in previous statements. Burke is an accessory to Francis' heresy by concealing it behind legalism, by being silent about the poison it contains and by the defense of document as a whole. He is a cowardly equivocator. If one disagrees, one must retract what they've said about Amoris Laetitia thus far and parrot Burke's observations in subsequent comments. I don't think it unfair to say that to rise in the Church hierarchy, you have to be some sort of a fag. The powers that be keep tabs on your escapades and have leverage to make you toe the line during times like these. Spare me any indignation but one has to ask, what have they got on Burke???? I hear a lot coming from the blogosphere about decorum when speaking of high ranking prelates, especially during times like these. I am trying to be as polite as I possibly can and am using the most gentle language to describe this man. He's like a Judenrat functionary enlisted by the Nazis to organize the trains to Auschwitz or a concentration camp inmate tasked with handing out soap and "breathe deeply, it's good for you" instructions to the poor souls headed towards the showers for special treatment. As much as you might hate Cupich, at least he's being honest. He makes no bones about what this document means. He comes out in the open and says this is a "game changer" and it is. Burke is just a fool and a tool.